Joining the recent trend in shared artist spaces, startup business workspaces, and “hacker” spaces are self-serve auto shops, USA Today reported. The garages are similar to — and sometimes inspired by — those on military bases, the newspaper reported. The Des Moines DIY Garage has 27 garage bays and charges $35 an hour. An in-house mechanic’s assistance is $85 an hour, according to the newspaper. The business model for DIY Garage could move to letting pro-quality mechanics rent space to help their own clients, similar to a barbershop, USA Today reported. As any traditional shop owner knows, the downside to starting one is that they’re capital-intensive, USA Today noted. And unlike a traditional shop, there’s no shot at bread-and-butter insurance claims to help pay the bills. Asked about the concept, Automotive Maintenance and Repair Association President Joseph Henmueller raised the safety issue. With the popularity of YouTube videos serving as a guide for amateur mechanics and parts more easily accessible through the Internet, it’s possible these kinds of sites could grow in popularity. 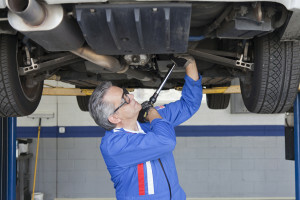 Though mechanic business seems most vulnerable to the concept, such garages could eat into low-level repair revenues for traditional collision shops as well. On the other hand, it’s likely that many clients will get halfway through the work, realize they took on more than they bargained for, and come crawling back. The other benefit of these garages would be the potential to train and inspire a new generation of car guys and girls to staff your shops.